The days may still be warm, but a chill in the evening air reminds us that fall is just around the corner. And even though summer has ended, there’s still time to enjoy the bounty of your local farmers’ market. Stands are filled with sweet potatoes, squash, apples, turnips, beets, cabbages, and pears. Low-cost and filled with flavor, these super foods are packed with nutrients such as vitamins A and C, minerals, and fiber. Most of us live within a few miles of a supermarket filled with products that meet our every need. So why shop at a farmers’ market when you can find everything you need at your local grocery store? The answer is simple: a farmers’ market is a delight to the senses and brings us closer to our food supply. 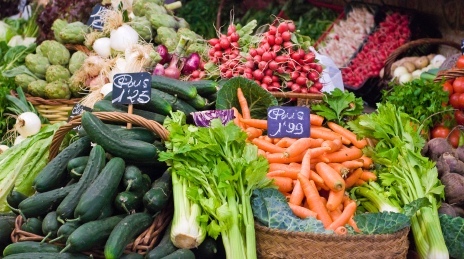 Fruits and vegetables at farmers’ markets are in-season and are usually local or regionally grown; certified organic products may also be available. Produce at farmers’ markets have a refreshingly natural, unpolished appearance. Eggs, poultry, and value-added products—jams, jellies, baked goods, salsa—may also be available. Shopping at farmers’ markets is also good for the environment. Food travels a shorter distance, decreasing the use of fossil fuels. Packaging is reduced, eliminating waste and extra costs. Farmers’ markets can also stimulate economic growth, attracting business to the community. Eat fresh produce within a few days to maximize taste and nutritional value. Enjoy fruits and vegetables raw or gently cooked until just-tender. Store salad items in the crisper drawer of your refrigerator. Keep fruits and vegetables whole, chopping them only when you are ready to eat them. Store root vegetables such as turnips and potatoes in a cool, dark, dry place, away from sunlight. Refrigerate fruits such as apples and pears if you don’t plan on using them within a few days. Although you may be tempted to overbuy at the farmers market, buy only what you’ll be able to eat. Then visit again next week! Sources: Agricultural Marketing Service; USDA. American Institute for Cancer Research Newsletter, Issue 61. Submitted by Jennifer Even, Extension Educator, Family and Consumer Sciences, Ohio State University Extension, Hamilton County/Miami Valley EERA. We appreciate you supplying such a lot of helpful SEO info in a single weblog. This really is a single I will want to bookmark. Thank you for the compliment. I’m happy to hear that you found the information benefical!